WIRELESS speakers? Audiophiles might not quite approve, although lesser mortals have surely often wondered – why not, given that almost everything to do with communication has taken this path? Not that there haven’t been attempts but nothing has demanded attention, thanks no doubt to sound quality that has ranged from average to dubious. Sending digital audio signals from a source, via a transmitter, to a set of speakers comes with its own share of problems (like interference, dropout, etc), so it isn’t surprising that there has been a lack of serious players in this field. That, however, changed in January this year when Dynaudio launched its Xeo system at the Consumer Electronics Show in Las Vegas. The Danish manufacturer is among the most respected loudspeaker names in business, and a significant presence in the electronics (remember the exotic Arbiter amplifier) and car audio (currently Volkswagen’s choice) sectors. The Xeo’s brief (apart, we reckon, from putting cable manufacturers out of business one day) was simple – a standalone set-up or an add-on component to your main system, free of connections to an amplifier. Yes, no wires … well, you do have to find an AC outlet to plug the speakers into, but that’s another story. The system comprises active speakers with digital amps on board, a transmitter into which analogue or digital sources can be plugged and a remote handset that can control up to three different sources and speaker set-ups. The transmitter, thus, also functions as the de facto preamp – provided are a set of analogue inputs, a Toslink optical input, a mini-jack aux input (for connecting smartphones, tablets, etc) and a USB port for hooking up your laptop (configured for PC and Mac soundcards). 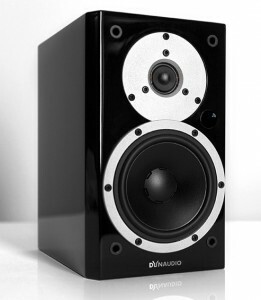 There are two speaker models – the standmount ‘3’ and floorstanding ‘5’. These units receive the signal from the remote controller and tell the transmitter what to do. The Xeo system can be expanded/configured into a multi-zone/multi-room set-up, mono or stereo. You can, in fact, have up to three different sources playing simultaneously into three systems. 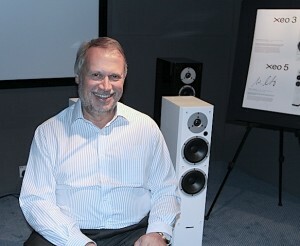 Here’s the most important part, though – the sound quality is unlike anything else you might have heard so far from any pretender, says Dynaudio International CEO and company founder Wilfried Enrenholz, who was in Kuala Lumpur on Aug 17 to visit local distributor CMY Audio & Visual. “I think we are the first company making a speaker which is wireless and with a real high-end sound. So far, all wireless solutions are quality compromised and, of course, for audiophile people, not acceptable. “But the Xeo system allows us to transfer the full CD quality, 44.1kHz/16-bit, to the speaker. We can handle signals up to 24-bit/48kHz in the transmitter. So you can really use the full digital quality we have today,” say Ehrenholz. He admits, though, that getting across to the audiophiles was the real challenge, describing them as nice folk but with preconceived notions. However, wireless technology has reached a level where it works well and reliably, thus Dynaudio’s decision to stride into this realm and design a high-end wireless speaker system, he adds. “You see many streaming devices from Linn, Naim and other companies. Digital streaming offers us a new level of quality and the good thing is, you’re not dependent on industrial standards any more with all this new technology. When it came to the Xeo system, the direction was plain enough, says Ehrenholz. The wireless technology (it works in the 2.4GHz band) is not unique, Ehrenholz says. “We’re working with normal wireless technology. Everybody has a router at home that works with wireless and this is the technology we’re working with to transmit the signal. We’re using normal DSP technology. We have some special (digital) amplifier chips which are not sold on the market. So this is based on just standard industrial technology. It isn’t that multi-zoom systems haven’t made their mark, but most require a lot of wiring to start with, plus another amplifier or two, which may have deterred many. Despite putting the transmitter through some stringent tests, there have been no instances of interference or dropout within a range of up to 100m, says Ehrenholz. “We’ve put a system in one hotel room and controlled it from five rooms away without any issue!” he recalls, adding that the speakers aren’t fussy about the room’s environment. Which brings us to a pertinent question – what about battery-powered active speakers to take the mains cable out of the equation as well? “Yes, we could have designed it with batteries but it would play for just about 15 minutes! The whole automobile industry is still having problems with batteries, so we didn’t take that approach,” Ehrenholz says. He, however, doesn’t discount that Dynaudio will be looking at this future, when battery capacity takes a giant step forward. Also, while Xeo is meant for two-channel applications right now, multi-channel systems in future are a possibility. It doesn’t hurt that the Xeo recently won the prestigious EISA award, as Europe’s Best Product in the category Wireless HiFi 2012-2013. During this interview, Ehrenholz demonstrated the capabilities of the Xeo system, and the sonic results from both the ‘3’ and ‘5’ were impressive – audioFI.net is in the process of procuring a pair of either for a review, so stay on this site for developments.